Sjøgren, Per Johan E; Damm, Charlotte Brysting. Holocene vegetation change in northernmost Fennoscandia and the impact on prehistoric foragers 12 000–2000 cal. A BP – A review. (prosjekt) Boreas 2018; Volum 48 (1). ISSN 0300-9483.s 20 - 35.s doi: 10.1111/bor.12344. Damm, Charlotte Brysting. Enfolded by the long winter`s night.. Oxbow Books 2016 ISBN 978-1-78570-191-7.s 107 - 116. Raggio, Osvaldo; Bánffy, Eszter; Damm, Charlotte Brysting; Gamble, Clive; Spinapolice, Enza E.. On the Condition of Dialogue between Sister Disciplines. Forty-four years after Marshall Sahlins' Stone Age Economics. Comments by Eszter Bánffy, Charlotte Damm, Clive Gamble and Enza E. Spinapolice. Quaderni Storici 2016; Volum LI (1). ISSN 0301-6307.s 245 - 300.s doi: 10.1408/84148. Damm, Charlotte Brysting. Interaction: When people meet. Syddansk Universitetsforlag 2014 ISBN 978 87 7674 824 1.s 227 - 239. Damm, Charlotte Brysting; Forsberg, Lars L. Forager-farmer contacts in Northern Fennoscandia. Oxford University Press 2014 ISBN 978-0-19-955122-4.s 838 - 856.s doi: 10.1093/oxfordhb/9780199551224.013.012. Damm, Charlotte Brysting. Religious practices in northern Europe 4000-2000 bce. Acumen Publishing 2013 ISBN 978-184-4657-09-4.s 63 - 69. Damm, Charlotte Brysting. Approaching a complex past: entangled collective identities. Equinox Publishing 2012 ISBN 9781845537425.s 13 - 30. Damm, Charlotte Brysting. From entities to interaction. Replacing pots and people with networks of transmission. 2012 (266) ISBN 978-952-5667-42-4. ISSN 0355-0230.s 41 - 62. Damm, Charlotte Brysting; Saarikivi, Janne. Introduction. Suomalais-Ugrilainen Seura / Finno-Ugrian Society 2012 (265) ISBN 978-952-5667-39-4. ISSN 0355-0230.s VII - XIII. Damm, Charlotte Brysting. Interaction Within and Between Collectives: Networking in Northern Fennoscandia. Suomalais-Ugrilainen Seura / Finno-Ugrian Society 2012 (265) ISBN 978-952-5667-39-4. ISSN 0355-0230.s 125 - 138. Damm, Charlotte Brysting. Ethnicity and Collective Identities in the Fennoscandian Stone Age. Uppsala universitet 2010 (51) ISBN 978-91-506-2128-0.s 11 - 30. Damm, Charlotte Brysting; Zvelebil, Marek; Vaneeckhout, Samuel. House Societies among Coastal Hunter-Gatherers A Case Study of Stone Age Ostrobothnia, Finland. Norwegian Archaeological Review 2010; Volum 43 (2). ISSN 0029-3652.s 179 - 184.s doi: 10.1080/00293652.2010.534594. Damm, Charlotte Brysting. From cultural dualism to a multicultural past: perspectives on interaction and identity in Fennoscandian archaeology. 2010 (1) ISBN 978-82-996367-7-3. ISSN 0809-8735. Damm, Charlotte Brysting. Fra form og stil til situert materialitet: Arkeologenes dans med den materielle kultur. Primitive tider 2008; Volum 10. ISSN 1501-0430.s 145 - 154. Damm, Charlotte Brysting. Interregional contacts across northern Fennoscandia 6000-4000 BC. 2006 (1) ISBN 951-42-8133-0. ISSN 0355-3205.s 131 - 140. Damm, Charlotte Brysting. Towards a Glocal archaeology?. Norwegian Archaeological Review 2006; Volum 39 (1). ISSN 0029-3652.s 75 - 77. Damm, Charlotte Brysting. Interregional Contacts across Northern Fennoscandia 6000-4000 BC. 2006 (8). ISSN 0909-9506.s 199 - 208. Damm, Charlotte Brysting. Hans Christan Gulløv (red): Grønlands forhistorie. (The Prehistory of Greenland). Gyldendal, Copenhagen, 2004. Scandinavian Journal of History 2005; Volum 30 (3/4). ISSN 0346-8755. Damm, Charlotte Brysting. Archeology, ethnohistory and oral traditions: approaches to the indigenous past. Norwegian Archaeological Review 2005; Volum 38 (2). ISSN 0029-3652.s 73 - 87. Damm, Charlotte Brysting. Bosetningen i yngre steinalder på Havnnes. 2004 ISBN 82-991454-6-5.s 22 - 29. Damm, Charlotte Brysting. Another Time, Another History? - Or how to write the history of the Bugakhwe. 2001 ISBN 91-973713-1-9.s 29 - 44. Damm, Charlotte Brysting. Scandinavian Archaeology goes Abroad. Current Swedish Archaeology 2001; Volum 9. ISSN 1102-7355.s 45 - 58. Damm, Charlotte Brysting. Time, Gender and Production: A critical Evaluation of Archaeological Time Concepts. Macmillan Publishers Ltd. 2000 ISBN 0-333-64332-1.s 110-122 - . Damm, Charlotte Brysting. Kulturminnevern og demokrati: problematikk omkring meningskontroll og vestliggjøring av kulturminner. En kommentar til Atle Omland. Primitive tider 2000. ISSN 1501-0430.s 167 - 171. Damm, Charlotte Brysting; Lane, Paul J.; Bolaane, Maitseo. Bridging the River Khwai. Archaeology, Tourism and Cultural Identity in Eastern Ngamiland, Botswana. 1998.s 344 - 350. Damm, Charlotte Brysting. Rituals: Symbols or Action?. 1998 (16) ISBN 91-85952-56-7. ISSN 0282-9479.s 443 - 449. Damm, Charlotte Brysting. Forhistoriske ritualer. En diskussion omkring mening og handling. Aarhus Universitetsforlag 1998.s 44 - 65. Damm, Charlotte Brysting; Saarikivi, Janne. Networks, Interaction and Emerging Identities in Fennoscandia and Beyond. Papers from the Conference held in Tromsø, Norway, October 13-16 2009. Suomalais-Ugrilainen Seura / Finno-Ugrian Society 2012 (265) ISBN 978-952-5667-39-4. ISSN 0355-0230.s 217 - 239. Solli, Brit; Bjerck, Hein B,; Hedeager, Lotte; Forsberg, Lars; Damm, Charlotte Brysting. Norwegian Archaeological Review. 2004. Solli, Brit; Bjerck, Hein B.; Myhre, Lise N.; Hedeager, Lotte; Forsberg, Lars; Damm, Charlotte Brysting. Norwegian Archaeological Review. 2003. Damm, Charlotte Brysting. Demographic patterns amongst hunter-fishers in Northernmost Europe 5500-1500 BC. Jomon in Transition: materiality, ritual and demography among prehistoric complex foragers 2019-01-11 - 2019-01-12 2019. Damm, Charlotte Brysting; Lentfer, Carol. Use-wear and residue analyses of Stone Age lithic artefacts from northern Norway: potential and preliminary results. The 13th Nordic Conference on the Application of Scientific Methods in Archaeology (SMIA) 2019-01-21 - 2019-01-22 2019. Damm, Charlotte Brysting; Skandfer, Marianne. "Åpen dag" på Taborshavn. Presentasjon av boplass med stor tidsdybde og utgravning av en tuft fra steinalderen.. Åpen dag for publikum 2018-08-15 - 2018-08-15 2018. Damm, Charlotte Brysting. 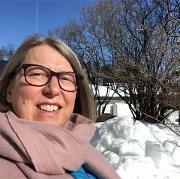 Norwegian Archaeological Review 1968–2018: Looking Ahead. Norwegian Archaeological Review 2018; Volum 51 (1-2). ISSN 0029-3652.s 1 - 5.s doi: 10.1080/00293652.2018.1551926. Damm, Charlotte Brysting; Hood, Bryan. Obituary: Ericka Maria Thrash Engelstad 1947-2018. Norwegian Archaeological Review 2018; Volum 51 (1-2). ISSN 0029-3652.s doi: 10.1080/00293652.2018.1535524. Damm, Charlotte Brysting; Skandfer, Marianne; Jordan, Peter. Re-Populating Prehistoric Coastal Landscapes: Emerging Results from the Sørøya Survey. Populating Coastal Landscapes 2018-09-25 - 2018-09-27 2018. Damm, Charlotte Brysting. Presentation of research project: Stone Age Demographics. Population Coastal Landscapes 2018-09-25 - 2018-09-27 2018. Damm, Charlotte Brysting. Steinalderens demografi: studier fra Nord-Norge. Forskningsseminar 2018-03-15 - 2018-03-15 2018. Damm, Charlotte Brysting. Archaeology and the pan-disciplinary future: at the crossroads of method and theory. EAA annual conference 2018-09-05 - 2018-09-08 2018. Damm, Charlotte Brysting. Stone Age Demographics: registreringer i Sørøysund og omegn. Prosjekt workshop 2018-02-15 - 2018-02-15 2018. Skandfer, Marianne; Damm, Charlotte Brysting; Vollan, Kenneth Webb. Investigating Long-Term Human-Environment Relationships in the European Arctic. The Arctic Science Summit Week (ASSW) 2017 2017-03-31 - 2017-04-07 2017. Damm, Charlotte Brysting; Gjerde, Jan Magne. Steinalderdag i Sandvika, Hasvik kommune. Steinalderdag for Sørvær og Breivikbotn skoler 2017-09-29 - 2017-09-29 2017. Damm, Charlotte Brysting. Steinaldertur. Guidet tur til Hollenderbakken, Store Sandvika og Avløysinga.. Guidet tur. 2017-09-30 - 2017-09-30 2017. Damm, Charlotte Brysting. Siste nyt fra steinalderen på Sørøya. Foredrag 2017-09-28 - 2017-09-28 2017. Damm, Charlotte Brysting. Demography amongst northern hunter-gatherers 2000-0 BC. 14 Bronsealdersymposie 2017-06-06 - 2017-06-09 2017. Damm, Charlotte Brysting. Stone Age demographics in Arctic norway: a multiscale approach. “Late Pleistocene Hunter-Gatherer Demography and Mobility”. 2016-09-22 - 2016. Damm, Charlotte Brysting. Stone Age pit house dwellings: the potential for examining population fluctuations. DNSZ workshop 2016-11-23 - 2016-11-24 2016. Damm, Charlotte Brysting. "Mesolithic pyro-technology: practices and perceptions in coastal Norway». The coastal Landscapes of the Mesolithic 2016-11-16 - 2016-11-18 2016. Damm, Charlotte Brysting. Single grave and Corded Ware societies. Theories on internal formation. mobility and Cultural formation.. Archaeological colloquium 2016-06-06 - 2016. Damm, Charlotte Brysting. Stone Age Demographics in Northern Norway. Biweekly colloquium 2016-06-06 - 2016. Damm, Charlotte Brysting. Stone Age Pyro-Technology: Practices and Perceptions. Preliminary thoughts.. Off-Site archaeology 2016-04-26 - 2016-04-27 2016. Damm, Charlotte Brysting. Perceiving through fire: how pyrotechnology and culinary recipes alter the environment. PAG Environmental humanities 2015-03-26 - 2015-04-27 2015. Damm, Charlotte Brysting. The organisation of early spirituality: Variations in locations and ritual practices in Stone Age Fennoscandia.. ACRA III 2015-09-15 - 2015-09-18 2015. Damm, Charlotte Brysting. Re-envisioning the religious perspectives of early northern hunters: From cosmology to spirituality?. CHAGS 11 2015-09-07 - 2015-09-11 2015. Damm, Charlotte Brysting. Fishing for diversity.. 13th Nordic Bronze Age Symposium 2015-06-09 - 2015-06-12 2015. Damm, Charlotte Brysting. Beyond rituals - constructing an approach towards prehistoric religion. Nordic TAG XIV 2014-04-22 - 2014-04-26 2014. Damm, Charlotte Brysting. The Spirituality of Early Northern Foragers: Did Early Hunter-Gatherers have Sacred Sites?. 20th Annual Meeting of the EAA 2014-09-10 - 2014-09-14 2014. Damm, Charlotte Brysting. Dissecting Diffusion: Technological Dissemination and Social Networks. 20th Annual Meeting of the EAA 2014-09-10 - 2014-09-14 2014. Damm, Charlotte Brysting. Delays in the Colonisation of Northern Scandinavia. Anthropological Models for a Reconstruction of the First African Frontier 2014-02-06 - 2014-02-07 2014. Damm, Charlotte Brysting. Aubrey Cannon (ed): Structured Worlds: The Archaeology of Hunter-Gatherer Thought and Action. Norwegian Archaeological Review 2013; Volum 46 (1). ISSN 0029-3652.s 133 - 135. Damm, Charlotte Brysting. Getting at prehistoric religion: ritual practices and sensory archaeology. Young Archaeologists in Ireland Annual Conference 2013-03-09 - 2013-03-10 2013. Damm, Charlotte Brysting. Mesolithic and Neolithic Religious Perceptions in Scandinavia. Guest lecture 2012-02-02 - 2012. Damm, Charlotte Brysting. The Materiality of Coastal Societies. IAI Spring Conference: Coastal Communities from the Mesolithic to the Modern 2012-04-20 - 2012-04-21 2012. Damm, Charlotte Brysting. Interaction: When People Meet. Northern Worlds: Landscapes, Interactions, Dynamics. 2012-11-28 - 2012-11-30 2012. Damm, Charlotte Brysting. Beyond Boundaries: From Ethnic Groups to Practice Networks. CECT V autumn conference “In, Out and In Between: Dynamics of Cultural Borders” 2012-10-17 - 2012-10-19 2012. Damm, Charlotte Brysting. Åsa Berggren: Med kärret som källa. Om begrepen offer och ritual innom arkeologin. Vägar til Midgård 13. Nordic Academic Press, Lund. Norwegian Archaeological Review 2011; Volum 44 (1). ISSN 0029-3652.s 118 - 120. Damm, Charlotte Brysting. The Stone Age of Northern Fennoscandia - Features and Research Questions. Guest Lecture 2011-10-10 - 2011. Damm, Charlotte Brysting. Artefacts, material culture and materiality. Artefact Studies Now! 2011-10-06 - 2011-10-07 2011. Damm, Charlotte Brysting. With the swamp as cold. Understanding sacrifice and ritual bonded archeology. Norwegian Archaeological Review 2011; Volum 44 (1). ISSN 0029-3652.s 118 - 120.s doi: 10.1080/00293652.2011.572689. Damm, Charlotte Brysting. Comments on Samuel Vaneeckhout: 'House Societies among Coastal Hunter-Gatherers: A Case Study of Stone Age Ostrobothnia, Finland' (Norwegian Archaeological Review 43(1) 2010). Norwegian Archaeological Review 2010; Volum 43 (2). ISSN 0029-3652.s 179 - 182.s doi: 10.1080/00293652.2010.534594. Damm, Charlotte Brysting. Store muligheter oppstår ved CAS. Glimt 2010. ISSN 1890-8489.s 16 - . Damm, Charlotte Brysting. Charlotta Hillerdal: People in Between. Ethnicity and material Culture - a New Approach to Deconstructed Concepts. Kuml : Årbog for Jysk Arkæologisk Selskab 2010. ISSN 0454-6245.s 313 - 315. Damm, Charlotte Brysting. Kulturminner i Segelvik-området. Kysttreff og markering av Kulturminneåret 2009-07-07 - 2009-07-08 2009. Damm, Charlotte Brysting. Steinalderkontakt. 2009. Damm, Charlotte Brysting. Interaction within and between identities:entangled networking in Northern Fennoscandia. Networks, Interaction and Emerging identities in Fennoscandia and beyond 2009-10-13 - 2009-10-16 2009. Damm, Charlotte Brysting. Regional interaction among northern prehistoric hunter-fisher-gatherers. CAS Workshop: Regional Specialists 2009-04-15 - 2009-04-17 2009. Damm, Charlotte Brysting. From cultural and typological entities to overlapping networks. CAS workshop: Interaction and Networking. theoretical and comparative perspectives 2009-01-27 - 2009-01-29 2009. Damm, Charlotte Brysting. Bosetning og næring i fortidens Kvænangen. 10000 år med næringsutvikling 2009-09-21 - 2009-09-21 2009. Damm, Charlotte Brysting. Approaches to a Complex Past: Entangled Collective Identities. Regions on the Periphery of Bronze Age Northern Europe 2008-03-13 - 2008-03-14 2008. Damm, Charlotte Brysting. Comment on Chirikure & Pwiti: “We are the owners of this heritage; we are not stakeholders”: reflections on community involvement in archaeology and cultural heritage management with reference to southern Africa. Current Anthropology 2008; Volum 49 (3). ISSN 0011-3204.s 476 - 477. Damm, Charlotte Brysting. Årtusener med samhandling i nord. Glimt 2008 (2). ISSN 1890-8489.s 13 - 15. Damm, Charlotte Brysting. Cultural interaction across the millenia. Impressions 2008 (2). ISSN 1890-8497.s 13 - 15. Damm, Charlotte Brysting. Collective identities perceived as networks and materiality. MATERIALITY, LANGUAGE AND IDENTITIES 2008-09-30 - 2008-10-03 2008. Damm, Charlotte Brysting. Foundations for interregional contacts 6000-3000 BC. Early Networking in Northern Fennoscandia: Kick-off seminar 2008-09-08 - 2008-09-10 2008. Damm, Charlotte Brysting. From entities to interaction. Linguistic Map of Prehistoric North Europe. 2008-10-16 - 2008-10-18 2008. Damm, Charlotte Brysting. Heterogene nettverk i det nordlige Fennoskandia. Nordic TAG (fulltekst) 2007-05-10 - 2007-05-12 2007. Damm, Charlotte Brysting. Arkeologenes dans med den materielle kultur. Jubileumsseminar for Primitive Tider 2007-12-07 - 2007. Damm, Charlotte Brysting. Ingvild Folkvord: Patentløsninger og Fingerspitzengefühl. Om å veilede til Ph.D.graden. UNIPED (Tromsø) 2006; Volum 29 (2). ISSN 1500-4538.s 64 - 65. Damm, Charlotte Brysting. Socio-economic territories or ethnic groups? Northern Fennoscandia in the 5th millenium BC. Uniting Sea II 2006-10-20 - 2006-10-22 2006. Damm, Charlotte Brysting. Steinalder i nord: fra regional til interregional forskning. Norsk Arkeologmøte 2004-11-11 - 2004-11-13 2004. Damm, Charlotte Brysting. Interregional Contacts among Stone Age Societies in northern Fennoscandia 6000-4000 BC. 22nd Nordic Archaeology Conference 2004-08-18 - 2004-08-23 2004. Damm, Charlotte Brysting. Interregional contacts among Stone Age Societies in northern Fennoscandia 6000-4000 BC. Dynamics of Northern Societies 2004-05-10 - 2004-05-14 2004. Damm, Charlotte Brysting. Jimmy Strassburg, Shamanic Shadows. One Hundred Generations of Undead Subversion in Southern Scandinavia 7000-4000 BC. Fornvännen 2002; Volum 97. ISSN 0015-7813.s 229 - 233. Damm, Charlotte Brysting. Jimmy Strassburg, Shamanic Shadows. One Hundred Generations of Undead Subversion in Southern Scandinavia 7000-4000 BC. European Journal of Archaeology 2002; Volum 5 (1). ISSN 1461-9571.s 133 - 135. Damm, Charlotte Brysting. D.J.Sheperd: Fynerary Ritual and Symbolism. An Interdisciplinary Interpretation of Burial Practices in Late Iron Age Finland. Acta Borealia 2000; Volum 2. ISSN 0800-3831.s 103 - 105. Damm, Charlotte Brysting. Kjønnsforskning i arkeologien. Ottar 1999 (3). ISSN 0030-6703.s 23 - 30. Damm, Charlotte Brysting. K.Fabricius & C.J.Becker: Stendyngegrave og kulthuse. Kuml : Årbog for Jysk Arkæologisk Selskab 1998; Volum 1997-98. ISSN 0454-6245.s 350 - 352.